The swashbuckling spinoff is also coming to Blu-ray 3D in February! 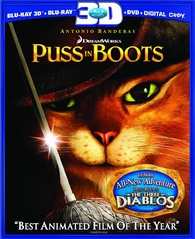 As previously reported, DreamWorks is preparing 'Puss in Boots' for a high-definition release on February 24, and now it looks like 'Puss in Boots - 3D' will be available on the same date. Antonio Banderas reprises his role as the sword-fighting cat in this animated prequel to 'Shrek.' The movie also stars the voices of Salma Hayek and Zach Galifianakis. Specs and supplements have yet to be revealed, but each release will be a combo pack with The Three Diablos animated short.